The expression does not make sense when translated into English, but I love it: Poisson d’avril, which literally means April’s Fish. Well, I guess I know what we are eating tonight. And that is no joke. Or perhaps I just wanted to post a picture of a colorful fish since I cannot imagine hanging this one on anyone’s back — we really do those things en France. Sérieusement. I cannot remember when was the last time I played an April fools’ day trick on anyone. Lulu will have to learn the tradition. She will love it. And the fish too. And there’s so much activity in our house. A daughter who is growing like une mauvaise herbe (a weed), says le papa. She is happy and *so* curious about everything. About every single detail of life. That’s what babies do. And there is my cookbook that requires so much of my energy. It will be another full month. Hopefully less fast. But as full. Well, I hope that you are also starting April on the right foot. Well fed. Happy and jolly. I just needed to stop by, to wish you a happy April Fools’ Day. 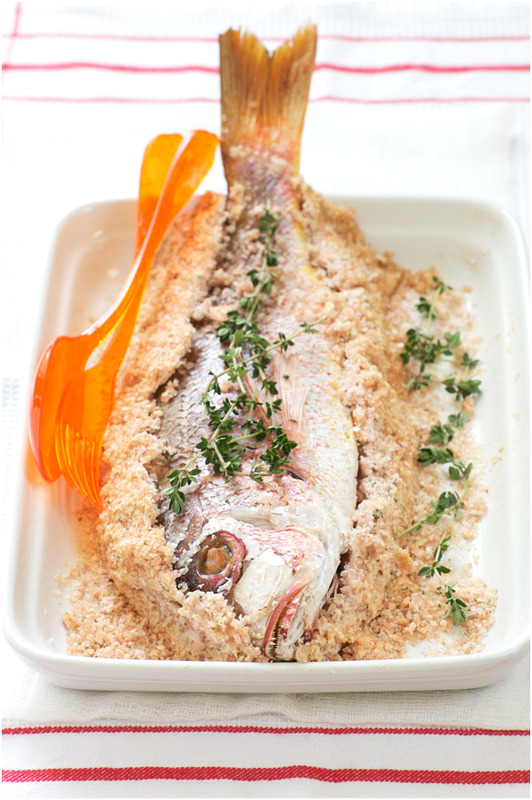 And share with you a simple fish recipe. Take a whole fish of your liking, thyme and sea salt, add a splash of olive oil, a few steamed potatoes on the side, and a tossed salad, and turn dinner into a simple fare. You’ve had something like this before, haven’t you? In a bowl, combine the egg whites, thyme and salt. Take a baking dish and add a bed of this salt preparation at the bottom. Place the fish on top. Cover it completely with the rest of the salt. Bake for 30 minutes. Remove from the oven and let cool for 5 minutes before breaking the crust of salt. The flesh of the fish should be extremely tender. Eat as is, or with a dash of olive oil, and steamed potatoes. Dans une jatte, mélangez le thym, le sel et les blancs d’oeuf. Placez une couche de cette préparation dans un plat allant au four. Mettez le poisson dessus et recouvrez complètement de sel. Enfournez pour 30 minutes environ. Laissez refroidir 5 minutes et cassez la croûte de sel. Dégustez tel quel ou avec un filet d’huile d’olive, et des pommes vapeur. So beautiful. I love when fish is prepared this way! Bravo! Happy April Fool’s, I’ve aleady played my joke for the day! i have never had fish (nor any meat for that matter) in a croute de sel. i am dying to try it. happy poisson d’avril! Quel beau poisson d’avril… et à n’en point douter très bon aussi. Très bon mois à vous. It’s very similar to the italian recipe for this fish (and I bet many of other mediterranean countries, it’s really a culinary brotherhood). I used to cook it wrapping the fish, covered on all sides with the salt, in tin kitchen foil before placing it on a baking dish ready to be placed in the oven. The fish looks wonderful Bea! I love the simple preparation and use of ingredients. absolutely fresh and delicious bea. i love fish cooked in a salt crust. beautiful. This looks lovely! I live in Japan and there are a lot of red snappers at the markets right now. They are always sold whole (as they should be) and this will be a great recipe for me to use! Thanks! I did not know that about April Fool’s, thanks for sharing. This fish looks lovely! the food styling of this photo ispure art! All your photos are always beautiful, but something about this fish really made me swoon! I think it was the delightfully bright and spring-like feeling it invokes. Gorgeous!! this fish is called:金丝鱼 in chinese. Fish-before and after, Great photos. I made the Spanish tortilla. Very tasty! Thanks for all the new posts. It’s always a treat to hear from you. Le poisson d’avril est aussi une tradition au Québec… évidemment, puisque nos ancêtres étaient Français! I love these photos. I am so hungry for fish now! It is nice to hear that life is going well! Gorgeous! I’m glad you’ve been posting more often…and I’m coming to the conference in June thanks to you! There’s a reason I don’t like to look at cooked whole fish and that’s because of the unhappy look on this one’s face! Happy April! By the way I would also be happy to help with recipe testing! My name is Katy and I work for how2heroes.com. If you are talented in the kitchen then you will love how2heroes.com! The site has tons of great recipes and videos that walk through each step of the process. It’s not just chefs though; there are mommy bloggers and cooking enthusiasts on the site as well. I wanted to share our Inn-dulge in New England contest to win a night at the charming Harding House in Cambridge, MA! The package also includes a copy of “The New England Cookbook” by Brooke Dojny and free museum passes to Cambridge and Boston museums. Just go to http://how2heroes.com/contest to sign-up. Bonjour Béatrice, je me permets de vous parler français puisque j’ai lu sur ce blog que vous êtes franco-américaine, otherwise i would have speak english 😉 j’aimerais avoir votre autorisation pour utiliser une magnifique photo que vous avez réalisée (http://www.flickr.com/photos/28757974@N00/2678987221/) c’est pour la réalisation d’une bannière de blog concernant ma famille, qui se réunit annuellement autour d’un pique-nique et je voulais utiliser une image représentant un pique-nique, et je trouve la votre si fraîche ! je serais si déçue de ne pas pouvoir l’utiliser !! :-/ Je vous remercie de votre réponse ! Wow, this looks so pretty! You make it sound so easy to make, even a kitchen disaster like me should be able to cook it :). It’s summer over here and the heat is on! So we are shifting towards lighter foods, sweet summer fruits, and yes, a fish like this would be most welcome! What a spectacular fish! Oh yes, simple and direct are best when you have the best seafood on hand. Thank you for sharing this. Absolutely gorgeous pictures. I love the fish recipe — so simple and so healthy — I hate it when beautiful fresh fish tastes are covered up by a zillion other ingredients. Thank you so much for sharing this yummy meal! 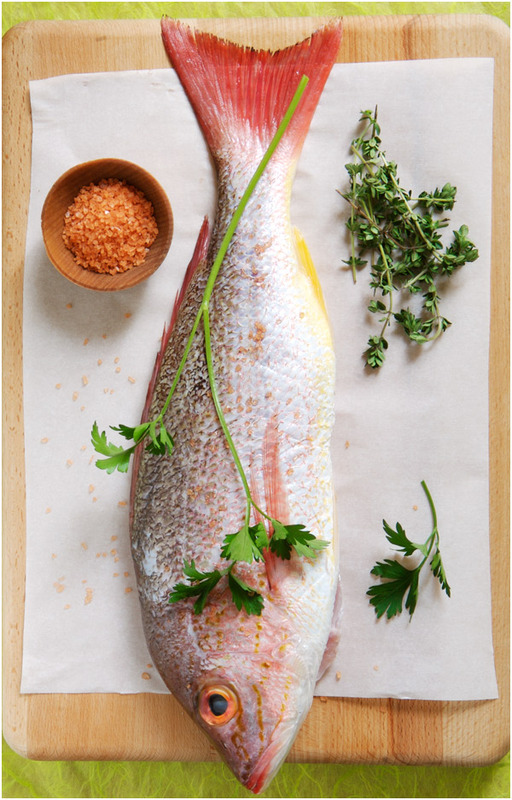 What a fantastic looking fish – both raw and cooked. Lovely presentation and recipe, as usual. Less is more…. few ingredients, fantastic result– as always. that fish is gorgeous! I love these photos! And I’ve never made a ahoel fish before, but have eatien in many times in Latin restaurants! I love your photos normally, but I can’t believe everyone swooning over this one. That fishes eye is so disgustinly shriveled. It distracts from everything else and just looks gross.